July 14, 2010  The "establishment" took it on the chin in Alabama's Republican primary runoff for governor, as Robert Bentley easily defeated Bradley Byrne, backed by a who's-who of the state GOP. July 13, 2010  Republicans pick their nominee for governor in today's runoff, a contest between former community college schools chancellor Bradley Byrne and state Rep. Robert Bentley. 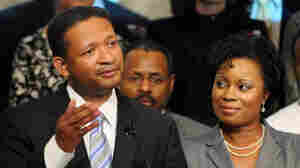 June 2, 2010  Rep. Artur Davis had a sizable lead going into Tuesday's Democratic primary for governor of Alabama. And yet he lost. Did Davis, in seeking out white support, take black voters for granted? June 2, 2010  Tuesday's primaries in Alabama saw Ron Sparks, the Agriculture Commissioner, surprising Rep. Artur Davis, who had hoped to become the state's first black governor. Also, Rep. Parker Griffith, a Dem-turned-GOPer, was defeated. June 1, 2010  Today's gubernatorial primary in Alabama features a Democratic black congressman who is at odds with many civil rights organizations in his state, and a Republican whose "English only" ad has gone viral.